Observed in the U.S. on the last Monday in May, Memorial Day is a celebration of remembrance for the brave service of military personnel who gave their lives for their country. TheHolidaySpot strives to mark this solemn occassion with a fabulous word search puzzle suited to the mood of Memorial Day. Attempt this cool puzzle activity and celebrate Memorial Day in a slightly different way. If you enjoy this Memorial Day Word Search Puzzle, please click here to refer it to your friends and share the fun. Wish you a happy Memorial Day! 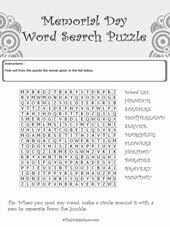 Celebrate Memorial Day with this exciting word search puzzle themed to the holiday. 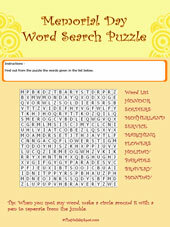 The puzzle has several words hidden in every possible direction - horizontal, vertical, diagonal, forward or backward, in a jumbled arrangement of letters. Try and find out all the listed words. Whenever you spot a word, encircle it with a pen to seperate from the jumble. So take out a print of the template given below and get started.